CAUTION! These are PLUS P loads. Do not use this ammunition unless you are certain your handgun is rated for Plus P pressures. Are you tired of spending big money on handgun ammunition that you cant return and then hoping that it feeds and functions correctly in your gun, your gun likes it well enough to shoot tight groups, it produces tolerable recoil, and it shoots to point of aim? But now you can find accurate and powerful ammo for a fraction of the money you would spend buying numerous full boxes of different ammunition. 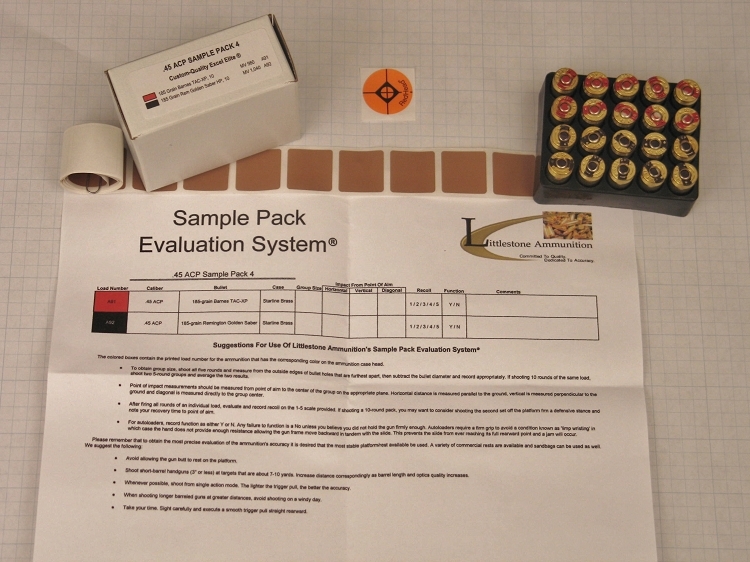 Our innovative, economical sample-pack system lets you test custom-grade ammo manufactured by Littlestone Ammunition. For less than you would pay for a single box of most decent ammo, you can test up to five of Littlestone Ammunition's different custom loadings of various bullet types and weights. Try some of Littlestone Ammunition's 20- or 50-round sample packs today. Then, when you find the load youre looking for, you can buy a supply knowing it will do the job for you instead of just hoping it will. Ten rounds loaded with 90-grain Sierra Jacketed Hollow Points, which has the widest opening at the tip of the bullet and a skived Power Jacket that extends to the bullet tip. It is designed to provide flawless feeding in all auto-loading pistols, as well as fast expansion for use at low to medium velocities. Starline brass cases.